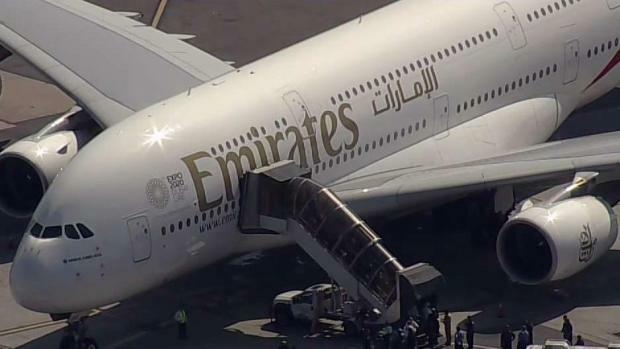 Rapper Vanilla Ice was one of the unlucky passengers on board an Emirates flight from Dubai quarantined for hours at John F. Kennedy Airport Wednesday. The “Ice Ice Baby” hitmaker was returning from a show in Dubai when he found himself on Flight 203 to JFK, where about 100 people complained of feeling sick on board. "So I just landed from Dubai and now there is like tons of ambulances and fire trucks and police all over the place," he tweeted. The rapper posted a video from the window of the double-decker plane. "Well a couple people got sick on the plane and it must be pretty serious because there's a lot of people out there," he says as he looks out the window at a mass of emergency response vehicles on the runway. Vanilla Ice, real name Robert Matthew Van Winkle, said he was on the top floor of the plane and he heard the outbreak was mainly on the bottom floor. His Twitter fans wasted no time punning on the rapper's songs. "I sure hope everyone is collaborating and listening," Justin Houch tweeted, in reference to Ice's track "Ice, Ice Baby." "Don’t they know that “if there’s a problem, YO” you’ll “solve it!," Jeff Sullivan replied. One of Ice's tour managers, Chuck Quon, confirms that they were on the Emirates plane returning from an event in Dubai. They are all getting on connecting flights to head home. At least 10 people have been taken to the hospital after a plane landed at JFK with about 100 people on board reporting feeling sick, federal and local law enforcement sources say. Adam Kuperstein reports.